Tennis accounted for a lot of excitement in 2012. There were seasoned players making their mark once again and there were new players who emerged from the shadows. And then there were the upsets. 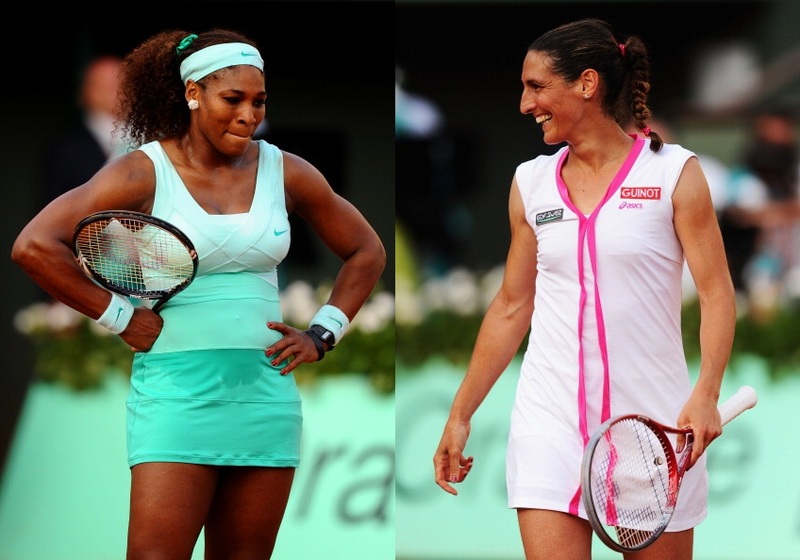 Unexpected results that stunned everyone, the list of upsets in 2012 summed up the unpredictability of the sport, especially in women’s tennis. Laura Robsons’s feat of pre-empting Kim Clijsters’s bid to contest one last successful US Open was monumental, just as Ekaterina Makarova’s efforts were to stall Serena Williams at the Australian Open. But more than any other tournament, it was the French Open that saw a long line of seeded stars tumbling. Victoria Azarenka went down to Dominika Cibulkova, while diminutive Sara Errani earned the prized scalp of Aussie Samantha Stosur. But Virginie Razzano’s polishing off of Serena Williams in three sets, right in the first round itself, rightfully became the talk of the tennis world. On paper, before the start of the match, it seemed like it would be a one-sided affair in favour of the American. Going up against a player ranked outside the top 100 and coming into the tournament on the back of title wins in Charleston and Madrid, the former French Open champion definitely looked strong. Even though she hadn’t displayed a power-packed performance at Paris in almost a decade since her victory there in 2003, a first-round loss was never expected to be on the cards for Serena. For the Frenchwoman however, it was a different story altogether. In 2011, Razzano played at Roland Garros while struggling with personal loss and tragedy, and only because of a promise made at someone’s death-bed. The death of her long-time coach, mentor and fiancé because of brain tumour marred her French Open preparations, and the strain to control her emotional anguish finally came to the surface as she was reduced her to tears after her first round loss to Australia’s Jarmila Gajdosova. But where Razzano was battling emotional stress in 2011, the 2012 French Open saw a different slant to the Frenchwoman. A certain something that allowed her do what no one else had ever tried to before. In her 13th French Open appearance – since her debut at the same arena in 1999 – Virginie Razzano inflicted on Serena her first-ever first-round loss at a Major. It wasn’t an easy victory; scrappy yes, patchy yes, remarkable, yes; but comprehensive? Not at all. Mistakes were made, faults were committed and errors sprung up throughout the course of the match. It was one of those play-offs which never really seem to end until they finally do and people realise that there at last has emerged a winner. Serena’s push-and-pull effect and Razzano’s yo-yoing kept the crowd going for 183 minutes until, like an abrupt pause, it all seemed to conclude for the American. The final game of the final set lasted almost 25 minutes with Razzano saving five break points and squandering seven match points in that time-span. And if Serena had indeed managed to break Razzano at that juncture, it wouldn’t have been as surprising as it was when Razzano finally converted her eight match point to win the match. That is how badly the odds were stacked against the Frenchwoman. Many players succumb to pressure at the final threshold of victory. Tennis has seen its fair share of such concentration lapses, when players – both seasoned and unseasoned – suddenly seem to lose the plot, and end up finding themselves at the losing end. Which is why Razzano’s ability to fight till the very end, battling cramps and fatigue, was truly incredible, and laid validation to the aforementioned aspect of a ‘certain unknown quality.’ Perhaps this is why, even though the second set tie-break is regarded by many as the pivotal moment of the match, the ninth game of the third set unambiguously sits as the crowning glory in the French player’s 13-year long tennis career. For the sheer shock value of the result and the magnitude of of the impact it created, Virginie Razzano’s defeat of Serena Williams at the French Open is our unanimous choice for the Upset of the Year on the women’s side.